Although its roots stretch back to 1961, Amnesty International didn’t really take flight until 15 years later, when producer Martin Lewis and comedian John Cleese began staging a series of benefit events designed to draw attention to the organization. Earlier this year, Shout! Factory assembled The Secret Policeman’s Balls, a definitive, three-DVD boxed set that provided a comprehensive look at the project’s genesis and evolution. 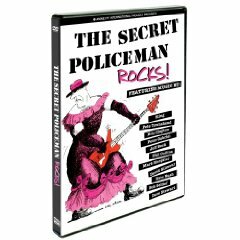 The Secret Policeman Rocks!, its hour-long companion, features a compilation of musical highlights, all of which were culled from four concerts that were held between 1979 and 1991. The limitations of the programs understandably meant that the artists had time to perform only a song or two each. This, of course, made it quite difficult for any of them to gain much momentum. As a result, there’s a certain amount of staidness that creeps into the material on The Secret Policeman Rocks!. In an attempt to counter this, the musicians were determined to make their appearances as distinctive as possible. Eric Clapton and Jeff Beck, for example, united on a pair of tunes. Although their give-and-take exchanges on Farther Up the Road were charged with electricity, the subsequent Cause We’ve Ended as Lovers fell flat because Clapton was rendered unnecessary to the proceedings. Elsewhere, Mark Knopfler and Chet Atkins collaborated on a delicate rendition of Imagine that was simultaneously sad and beautiful. The problem, however, is that, in retrospect, many of the songs that are featured on The Secret Policeman Rocks! have been undercut by the fact that they have since become familiar touchstones at benefit concerts. Peter Gabriel has turned Biko into a predictable routine, while Bob Geldof has built a career around the classroom shootout I Don’t Like Mondays. At the time, Sting was in the process of distancing himself from The Police when he delivered solo renditions of Roxanne and Message in a Bottle. Phil Collins also was testing the waters when he used a piano and an acoustic guitar to frame the haunted sorrow of In the Air Tonight. Yet, in both cases, these arrangements quickly became the norm rather than the exception. The two tracks on The Secret Policeman Rocks! that continue to retain their full potency were contributed by Pete Townshend. His solo appearance in 1979 was responsible for widening the purview of the event, and no one else has managed to achieve the same lasting level of magnificence. To this day, Pinball Wizard and Won’t Get Fooled Again — the former with its jittery, caffeinated, rhythmic strum and the latter with its quiet, seething intensity — remain wholly captivating. In the end, aside from these songs, nothing on The Secret Policeman Rocks! is terribly vital. When it is taken in full, however, the collection serves as a reminder of the slow march of history. In the past 30 years, nothing has changed. Amnesty International still plays a necessary and crucial role in protecting the integrity of human civilization.